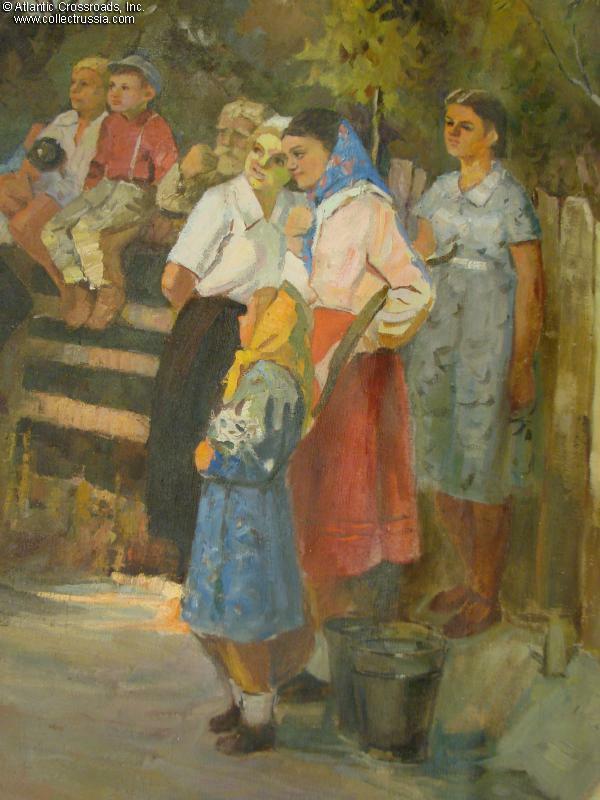 Liberators [our title, the real title unknown], oil on canvas, either an original painting or possibly a Soviet period reproduction of a 1940s-50s original. 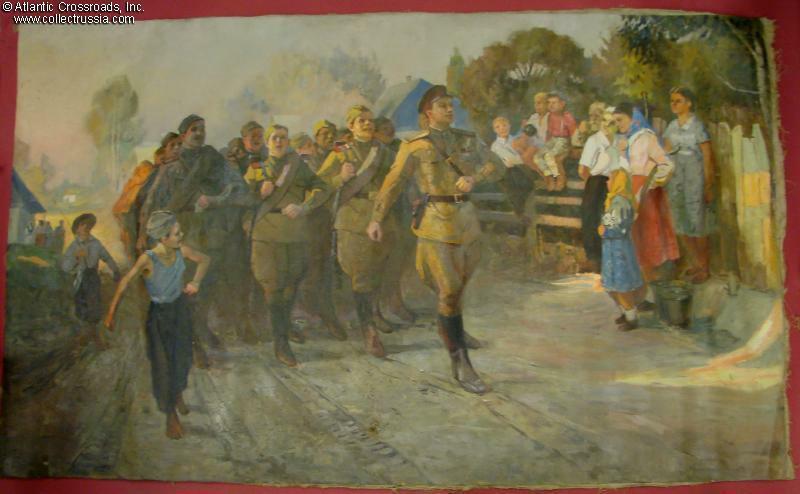 Liberators [our title, the real title unknown], oil on canvas, either an original painting or possibly a Soviet period reproduction of a 1940s-50s original. 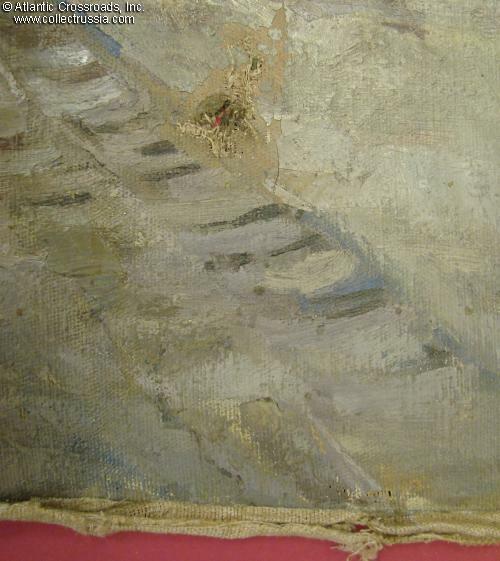 Very large format, about 4' x 6 ½'. 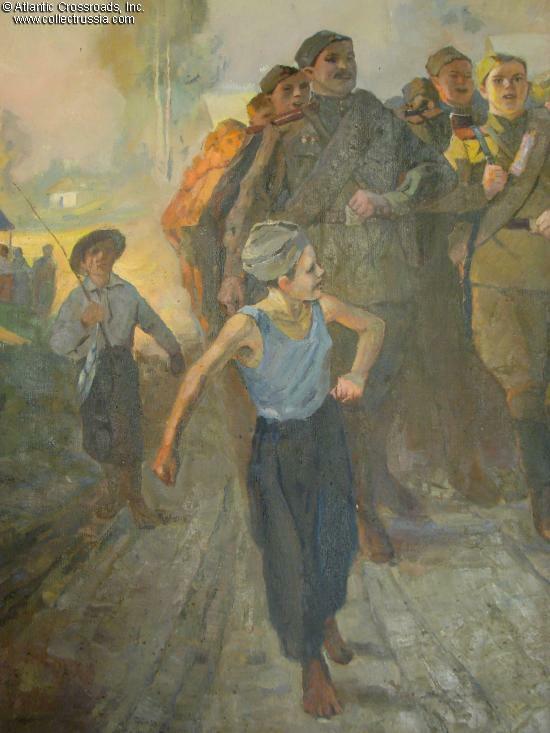 The artwork features WW2 Red Army infantry marching through a recently captured area, somewhere in East Europe judging by the clothing of the civilian spectators. 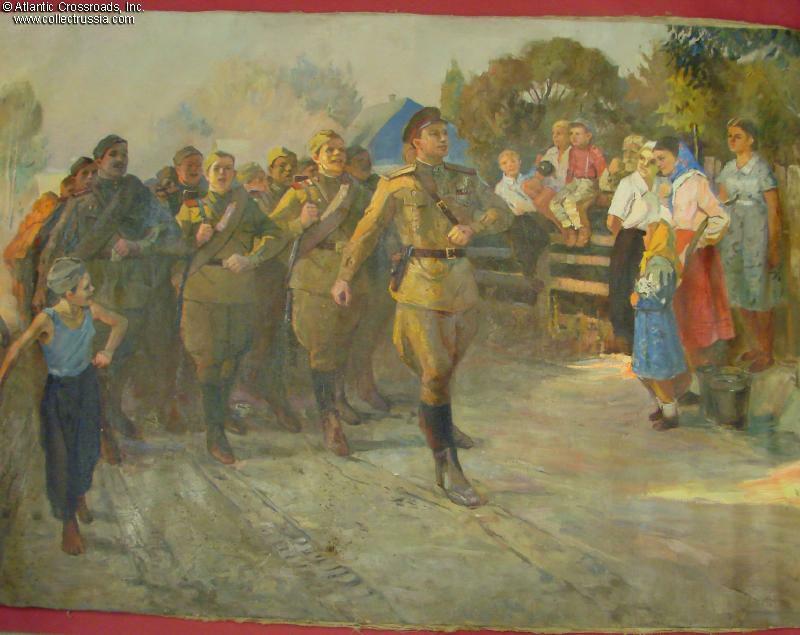 Painted in the best tradition of Soviet propaganda art, the fresh hues of the morning sky, gold tones of the fields and bright green young foliage augment the rather cheerful disposition of the crowd and the triumphant expressions of the singing soldiers. Since the Soviet soldiers are naturally marching west, the sun behind them of course represents the dawn of the new era. Of special interest to militaria buffs are the details of the uniforms that are very precisely executed, including the five-sided shape of the officer's shoulder boards (the type used only until about 1946-47). Note also the conspicuous absence of military age men among the greeting civilians. 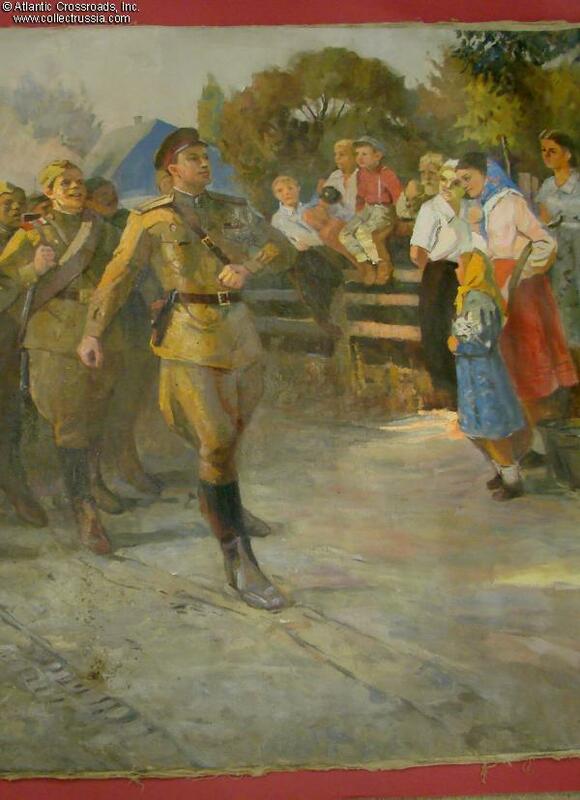 This painting probably once adorned a Soviet governmental office, local memorial museum or a military school. 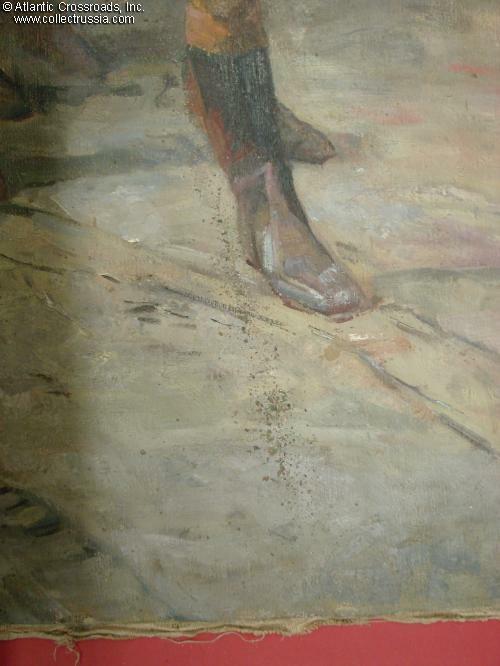 It is professionally hand-painted in oil on canvas, and although not marked, likely 60s or earlier vintage. 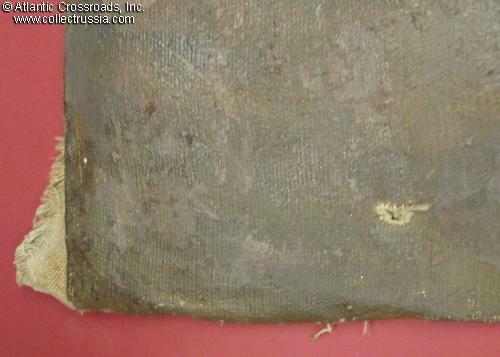 Condition is good overall although some restoration may be required for the two small tears near the bottom. 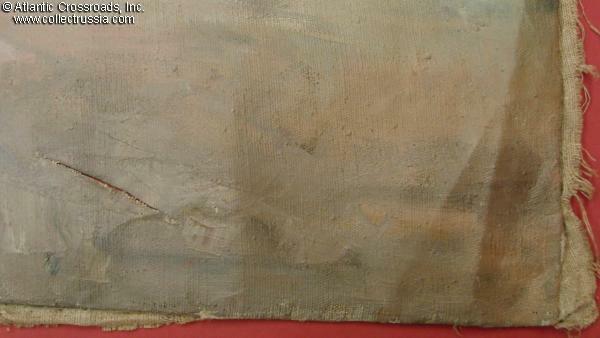 The paint is fairly stable and there are no large areas of lost paint, only small scuffs here and there (note, since the painting will be stored and shipped rolled, additional small flakes of paint may come off).